It’s a school of psychology developed by Dr. William Glasser that explains why and how we behave. Choice Theory teaches us that we have 5 basic needs which we seek to fulfill in all aspects of our lives. In trying to meet our needs, we often come into conflict with each other (or ourselves) because of external control psychology, the cause of all our unhappiness. 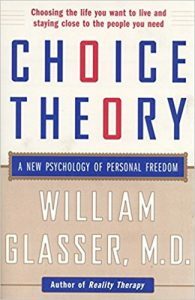 Choice Theory gives us a clear framework to help us understand what is external control, why it makes us unhappy, what is the real motivating force behind all our behaviors, and what we can do to make better choices. Reality Therapy is often mentioned with Choice Theory. What is it? It’s a counseling technique based on Choice Theory psychology. Through guided discussions, it attempts to help a client gain more awareness into what he really wants, what is he doing to get it, and whether it’s helping him or not. The discussions include plans of action to help him get what he wants, or as close as possible to it, so he can satisfy his basic needs and be happier. In essence, Reality Therapy is about learning more effective life skills. Choice Theory is like a map and Reality Therapy a car. Reality Therapy helps you learn how to better navigate the map. It also helps you get in the most suitable car for your journey. How is Reality Therapy different from other counseling therapies or coaching? Reality Therapy is concerned with what is happening now and what one can do about it. In addition to reflecting on the past and coming to an understanding of why you did the things you did, Reality Therapy also seeks to empower you to take ownership for your actions, evaluate the choices you’re making and change current behaviors so you can create a more satisfying future. It is comparable to what is done in CBT or coaching, but the baseline is to satisfy your basic needs. Do you offer Reality Therapy sessions? No, I don’t. Rather, I teach concepts of Choice Theory so that you can gain more self awareness. If you’re stuck in a situation that’s causing you a lot of stress and unhappiness and you want to know how to get out of it, that would be a good time to do Reality Therapy, but I prefer to leave this task to psychotherapists.